Description: Cap 10 to 75 cm across, main branches up to 3 cm thick, branching repeatedly, bearing clusters of spines on the ends of branches and from lateral nodules, white to creamy, yellowish-buff, orange-buff; teeth up to 2.5 cm long, usually 0.5 to 1.0 cm long, fleshy but brittle. Stem thick, knob-like, tough. Smell and taste mild. Habitat: Solitary to several on conifer stumps, logs or trees; fruiting early to mid fall. Primary keys: White to off-white coral-like or “icicles” growing on conifers. Edibility: Choice: mild and a bit crunchy, with a hint of seafood. It needs a fair bit of cleaning but can be washed in water. Bitter when old. Notes: Michael Kuo calls these a ’55mph’ mushroom; one that you can identify at high speed from your car. Unfortunately a lot of these grow too high to be harvested. Their growth and decay are rapid, but the fruiting is annual for many years. 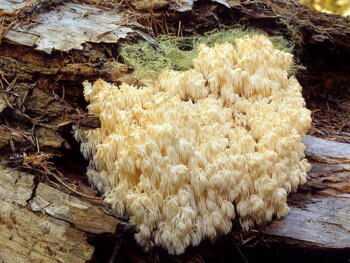 Hericium coralloides is a very close cousin with a more compact form, shorter spines and growth on hardwoods instead of conifers. Heat butter in a skillet over medium heat. Saute Hericium and shallots for 5 minutes. Add parsley, salt and pepper. Saute another minute to blend flavors. Keep warm. Heat olive oil in a skillet over medium-high heat. Add spinach and arugula. Cook until any liquid has evaporated. Keep warm. Heat butter in a pot over medium heat. Add flour and cook roux 3-4 minutes. Gradually whisk in fish stock then milk. Cook until almost bubbling. Add lemon juice, tarragon, salt and pepper. Cook another 2 minutes. Keep warm. Bring water, vinegar and salt to a low boil in a non-reactive pot. Crack eggs individually into a small bowl to make sure there is no shell or broken yolk and then slide each into poaching liquid. Cook until the whites are completely set and the yolks begin to thicken but are not hard, about 5 minutes. Take out eggs with a slotted spoon in order of putting in. Keep warm. Place 2 muffin halves onto each of 4 plates. Top each with even portions of sauteed greens, then mushrooms, a poached egg, and top with Veloute sauce.